/skrôld/ ~ (verb) 1. written hurriedly, untidily. (noun) 1. sketches and scraps by Mario Estioko. 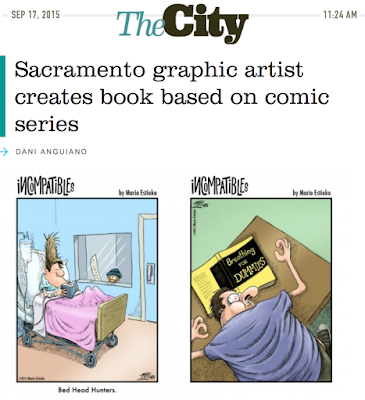 Sactown Magazine recently posted an article about my book Kickstarter in The City section of their blog. 24 hours left on the Incompatibles Kickstarter! 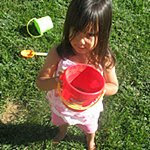 Please pledge and/or share if you can. Many thanks! Thanks again for your support on my Incompatibles Kickstarter. I promise the promo messages will now shrink. They will be replaced by cartoons! $8000 ~ A spot gloss will be added to the printed book’s cover text, making it shiny and extra spiffy. Plus, all backers will gain download access to various Incompatibles-themed wallpapers, yo! $9000 ~ All backers whose rewards included the physical book will receive a set of four nifty Incompatibles postcard prints. Mail them. Frame them. Love them. $10,000 ~ All backers whose rewards included the physical book will receive a super-awesome Incompatibles fridge magnet. You will be the envy of all your kitchen guests. 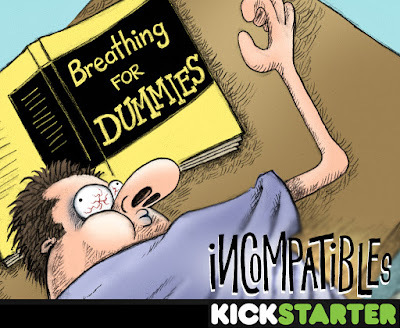 A HUMONGOUS THANKS to all the backers and sharers who made this Incompatibles Kickstarter happen in a smooth 14 days! You guys are THE BEST!!! This really would not have happened without you! I'll post up our first stretch goal later tonight, which will include some fun rewards for the different tiers of pledgers who have already donated. For now, let's just revel in the awesomeness of having accomplished this feat. 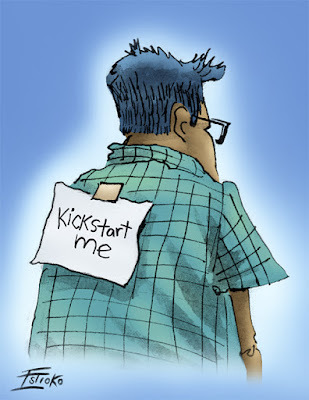 Okay, this is a little TBT on a Sunday, but this cartoon from my 100 archive succinctly expresses the gratitude I feel about everyone's Kickstarter love. You guys rock! We're at 85% funding for the book! The Incompatibles Kickstarter Project has officially launched! 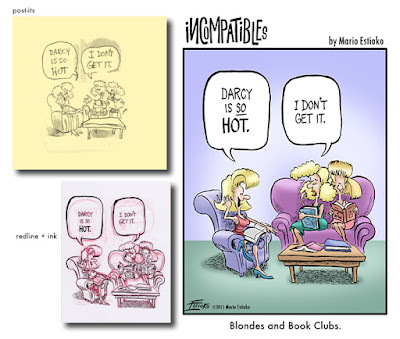 Please help support this project so we can all see Incompatibles in print. Go to https://www.kickstarter.com/…/incompatibles-book-the-first-… to learn more about the book project and how you can contribute. Oh, and please “Share” this link with all friends, family and taser enthusiasts. The post-it at upper left is horizontally flipped. 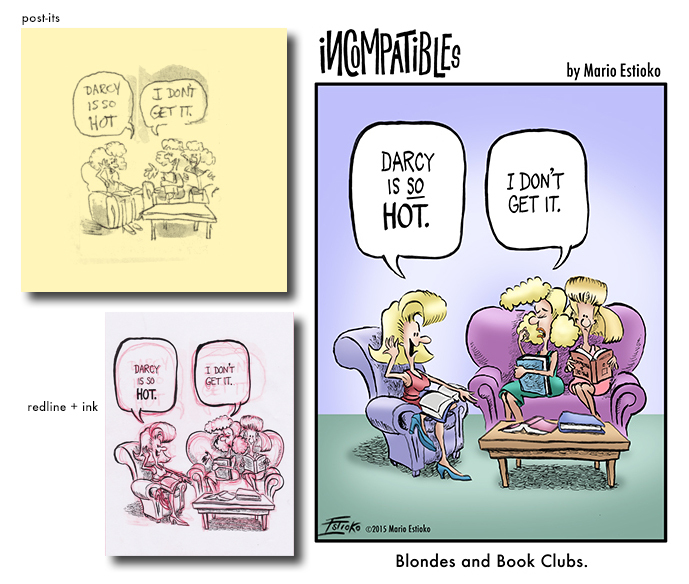 When I originally drew the thumbnail, the girl saying "Darcy is so hot" was on the couch. For continuity's sake, it seemed more smooth to swap the girls' placement, so the post-it you see is the second one I did. Nailing the expressions on these ladies faces and hand gestures proved challenging. 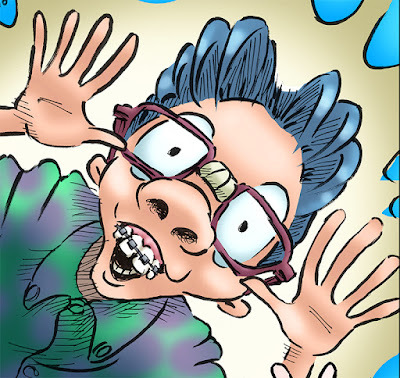 Sometimes I'll finish roughing a cartoon and feel there is something wrong. It can sometimes be an absent, superfluous or misplaced prop. But more often than not it is a mediocre facial expression or irrelevant hand gesture. It's amazing how much of a difference these things make in the gestalt of a gag. It's hard to see, but look at the face and hand of the gal sitting on the couch saying "I don't get it" in the redline/inked drawing. Her hand is open, eyes squinted and mouth down-turned. I really wanted to play up her complete disinterest in this activity, so I changed these features digitally once I scanned it in. In the final cartoon she is looking down at her nails with poofy red lips and you can almost hear the cynical "valley girl" tone in her voice—all this by just adjusting a few lines. This cartoon had a few more moving parts than usual. 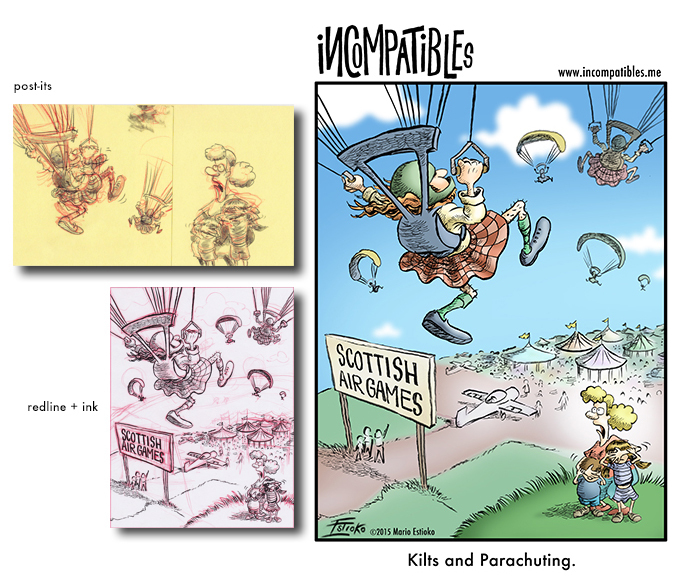 I had three specific things that I wanted to help people to see in the visual: the primary, kilted parachuter (obviously); the horrified mother looking on; and finally the signage that helps clarify the gag. 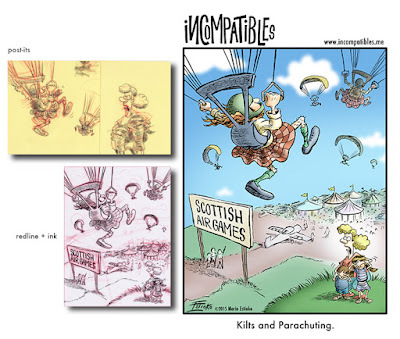 Sure the joke is understood with just the man, the woman and the caption, but I wanted to side-step the questions an abbreviated cartoon would pose: Why is this random guy parachuting in a kilt? And why is this lady and her kids in the field looking on? Contextualizing this with the Scottish Games/Air Show twist made it come together nicely. In fact, now I'm wondering if I should've omitted the sign element and simply used “Scottish Air Games” as the caption. Hindsight’s 20/20. The other dilemma was deciding how much detail to include in the background. I used muted colors and abbreviated line art to keep the fairgrounds from jumping forward in the composition and confusing the gag. It took a while playing with color combinations before it felt right, but I'm pleased with final result. You've reached the drawing/creative craft blog of Mario Estioko. It's here that I'll be parking all of the sketches and musings that lead to my visual stories. I'll also be throwing in commentary on other stories I consume (i.e., movies, comics, etc). Tune in to see current updates OR sign up for the RSS feed below. 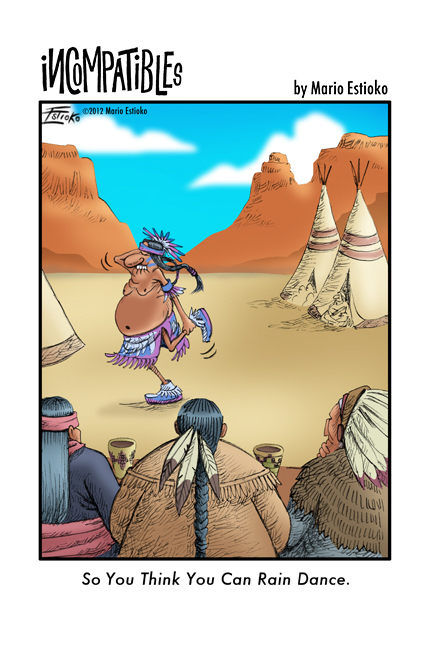 And if you'd like to keep up with my cartoons and comics, give a “Like” to the Facebook pages listed to the right.